A couple of weeks ago the wind blown from north-east, in a pleasurable day of shining springy sun. I decided to drive towards Terrasini (PA) to reach a small bay that I had visited the first time a couple of years ago. The sound of the undertow of that narrow pebble beach, typical of Palermo and Trapani areas, still echoed in my mind: the waves shake the small rounded stones, the water flowing in between them and transforming them in very sonorous rattles. I recorded with my Sennheiser MKH8020, trying to obtain a result that could resemble an underwater – from the sea bottom – perspective. Although the undertow sound is very well known by everyone, I still find fascinating the way in which this kind of beaches can make it nearly ‘earthy’. 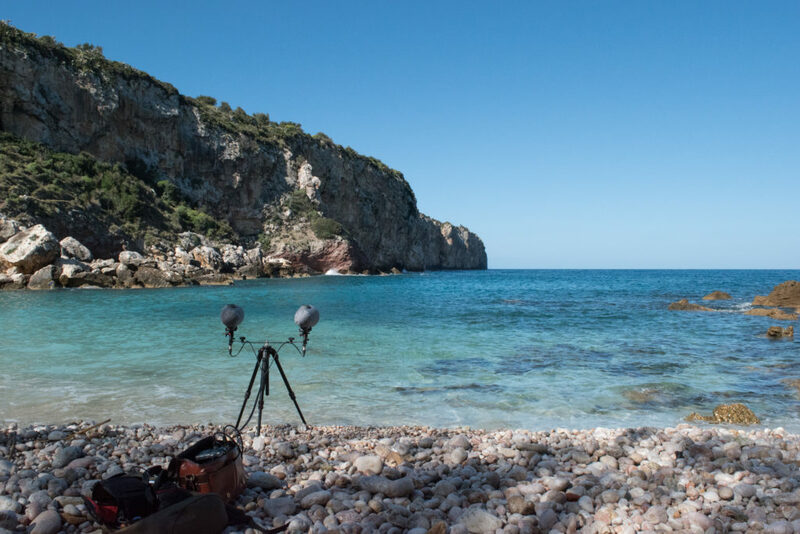 From time to time it is possible to hear in the background of the recording some oceanic seagull, which nowadays has become a naturalized Mediterranean species. The wind was not particularly strong and the waves (as you can see in the picture) were light and not violent at all. I suggest a low to mid level of playback, in order to respect the original atmosphere.